Muddy says: a sure-fire way to get ’em away from the TV, this beautiful farm with animals, activities and play barn is always a massive hit with kids, come rain or shine. Sacrewell Farm and Country Centre is set in the beautiful Cambridgeshire countryside just outside Peterborough. It’s run by the William Scott Abbott Trust, a charity dedicated to connecting people with food, farming and the countryside. There’s plenty to keep your family entertained, with friendly farm animals to meet, outdoor spaces to discover and a recently restored eighteenth century watermill. By giving each child a love of the countryside, we hope to inspire them to conserve it for years to come. We have an amazing visitor programme of children’s activities; from pond dipping to den building to baking bread to animal handling. 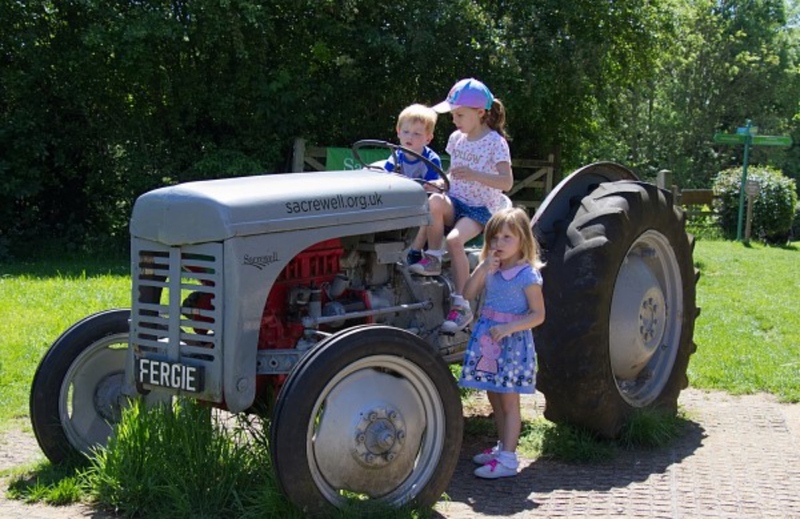 Children gain a deeper understanding of where their food comes after a visit to Sacrewell. Sacrewell offers amazing farming experiences so that you can get close and personal with the animals. In our Young Farmer’s Apprentice’ sessions children spend half a day getting stuck in to real farm chores like mucking out the ponies or collecting eggs. Or try a ‘Lambing Experience’ where you will have the opportunity help to care for our lambs in their very first hours and days and even witness the live birth of a lamb (if the ewes cooperate)! Our traditional skills programme includes blacksmithing at the forge, basket weaving from the willow coppice, baking bread in the Victorian bakery and making your own cider. The William Scott Abbott Trust at Sacrewell is making very real connections between field and fork whilst celebrating our rural heritage. Meet our rare breed farm animals, including our Landrace piglets, our Lincoln Longwool sheep and our two heavy Suffolk Punch horses. Join us on a story that discovers how farming has changed over the years and why these breeds are so extraordinary. We also have a farm gift shop, the Origin8 Café, indoor soft play and camping. Without you, we wouldn’t be able to inspire a connection with the countryside so we thank you for all of your support. As part of the William Scott Abbott Trust, we’d like to invite you to take a breath of fresh air in our favourite place.